Woodland Daughter is set in Yorkshire in 1902, Queen Victoria has died and the new century has brought in many changes, including another Boer War in South Africa, which features a little in this story. A new century brings change to the carefully ordered world Eden Harris maintains, change that threatens all she holds dear. Despite years of devoted service to the Bradburys, the leading family of the community, Eden hides a secret that would affect them all. When an enemy returns, her world is shattered and her secret exposed. Torn and provoked, she strains to protect her family until a devastating accident leaves her alone and frightened. As the threat against her grows, Eden takes her precious daughters and flees from the only place she's called home, to live amongst masses in York. Her attempt to start anew is not so simple as the past haunts her, and the one man she thought lost to her so many years before, returns to claim what has always been his. Eden must gather her strength and look into her heart to accept what the future offers. Can she find the happiness she longs for? Joel rested his body against the ship’s rail, bracing himself for the slightest pain in his shoulder. With one arm in a sling tucked beneath his uniform jacket, he was careful to keep out of the way of people. The slightest touch could have him sweating in pain. The sea breeze lifted the hair on his forehead and neck, cooling him slightly. He needed a haircut, but he’d wait until he’d reach England before attending to that. Below him on the deck, he watched the crowds scurrying about like ants. Soldiers, nurses, travellers, ship crew, dock workers all hurried back and forth. Behind him, from within the ship, came the noise of eager travellers settling in for their ocean journey. He stared out into the distance, where Table Mountain dominated the view. He was sad to be leaving Africa. He’d come to think of it as home in a way. The sights and sounds, the heat and people were familiar now. Of course nothing competed against Bradbury Hall, but he’d been in Africa for seven years. It was a long time. The army had replaced his family. He’d learnt to rely on his fellow officers to ease the loneliness, and at first it had worked well. The adventure and excitement kept his mind from thinking of home. But lately, for the last year and a half, a yearning to return home had claimed him and not let go. The ships funnels belched smoke and the boarding siren wailed. Under his feet he felt the deck shudder as the enormous engines surged with power. Anticipation welled. He was going home. Despite the ache in his shoulder, he smiled. Time to start a new phase of his life. Time to reaffirm the links with his family, the estate, old friends, and… Eden. He was conscious of the changes awaiting him back home. Much had happened in his absence. Not long after he joined the regiment, his mother died. That had been a blow, but on the whole he had managed to keep the family and home intact in his mind. When he’d left England, his father had been alive, Charlie well, Annabella cheeky, pretty, naive and Eden… Eden had been beautiful, a free spirit of the woodland where she lived. The ship eased from its berth and glided out into the harbour. The breeze sharpened and Joel turned away from the rail. He glanced at a crippled solider standing near the door leading into one of the saloons. The soldier swayed on his crutches, one leg gone in battle. Joel checked his step and hurried over to steady the man with his good arm. “Thanks, Sir.” The solider smiled. “Stevens, isn’t it?” Joel mused, helping the man to lean against a wall and out of the way of other passengers. “Stevenson, Sir, Corporal Dave Stevenson.” He leaned against the support and breathed out slowly. “I still haven’t got the hang of these things yet.” He held up the crutches. “There’s nothing better in this world than returning home to a family that loves you.” A picture came into Joel’s mind of the estate in autumn, the tall graceful trees, their leaves turning gold and amber, the squirrels scurrying around in the wood, collecting the last of their booty, harvest time and bringing in the hay, the smell of open fires as the gardeners raked up and burnt the fallen leaves. A group of children ran by, the shoes thundering on the timber deck. One cheeky boy paused and waved to Joel and Stevenson before scampering off again. A harassed nanny tried to catch up as she wheeled a pram after them. Joel watched until they turned a corner at the bow of the ship and were out of sight. His heart constricted, thinking of the boy’s lively face. A son. He wanted a son so badly it hurt. A boy to teach all the things his father taught him, to hunt, to fish, to ride, to play sports. He thought of Charlie. Two sons perhaps. Two fine boys to grow up together like he and Charlie did. Buy in ebook or paperback from all online retailers such Amazon USA and Amazon UK, iBooks, Nook, etc. Hannah has carried a flame for Cooper since the moment the stubborn cowboy took her son on as a bull riding student. Way back then, she saw the good man beneath the bad- boy exterior. Now she’s finally going to do something about her feelings. Cooper might think his life is over, but Hannah sees more for him—for them, together. And she’s not giving up until he sees it too. Warning: Contains a decade’s worth of pent-up sexual tension that’ll be smoking up when it comes charging out of the chute! 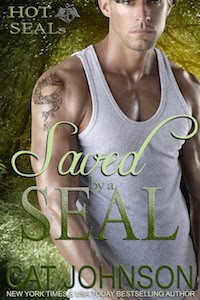 Bad boy Zane Alexander traded his family's wealth for a Navy SEAL trident. Now he needs his father's millions but there is a condition. Zane has to date the Senator's daughter, Missy, and pretend to like it. But when Missy is kidnapped and Zane's team must save her, the danger and his feelings turn very real. Zane watched as Jon strode across the bar toward him. “Good. You’re here.” Jon dumped a binder on the table. “I am.” Amused that Jon had finally figured it out, Zane raised his glass in a toast to his gullible friend. Apparently Jon was a little slow in detecting sarcasm. Zane took a swallow of the brew that was already getting warm. He’d arrived early for this meeting with his current teammate and soon-to-be business partner. Truth be told, he’d needed the drink. Zane had faced the enemy with less trepidation than he felt now on the way to see his father. . . and the enemy had been carrying automatic weapons with the intent of killing him. His father utilized weapons that were more subtle than machine guns and explosives, but no less destructive. Zane should know. He’d been dodging his father’s verbal shots for as long as he could remember. He still had yet to figure out how his mother, bless her heart, had survived this long married to his father. By keeping her head down and remaining below the radar, most likely, while Zane had a tendency to get right in his father’s face. Or he had until that day he announced he was joining the Navy and walked out with nothing but what fit in his bag. Thank God for the trust fund his maternal grandfather had set up. Zane’s father could—and had—cut him off from the family’s wealth and support, but even he didn’t have the power to take away the trust fund in his name or the monthly allowance it yielded him. Not that Zane’s expenses were huge—living in the bachelor barracks when not deployed was cheap—but Zane did like having nice things. Big trucks. Fast cars. Hot women. That all took a good amount of cash. More than he made from his military pay, so the check was surely welcome when it appeared in his account each month. “Do you want to take a look at what I put together?” Jon looked a little disappointed, almost crestfallen that Zane hadn’t jumped to devour the binder page-by-page. Even with the kickass winged anchor logo and company name they’d come up with on the front of it, the binder looked too much like the schoolwork he’d always hated. Though he supposed he would need to review the material before he met with his father later that day, it could wait. “I will. Later.” Procrastination was one of the many things Zane excelled at. He took another sip of his beer and ignored the book Jon had nudged toward him. He’d be drinking whisky if he didn’t have to get behind the wheel and leave for his drive to the capital region in an hour or so. GAPS—Guardian Angel Protection Services—was Jon’s brainchild and it was a great idea. A company comprised of a group of men with the best training the Naval Special Warfare Development Group had to offer. As combat-seasoned SEAL operatives, they would be experienced experts-for-hire at a time when precision security was a growing need in so many areas across the globe. With their friends and former teammates Chris and Rick already out, and with Jon and Zane’s current contracts about to expire, they had a four-man team to staff GAPS out of the gate with the promise of more of their teammates joining them in a few years, if they could make a go of it. Zane traced the tip of one finger over the letters of their tagline printed on the paper slipped beneath the clear plastic front of the binder. We cover your six when God’s too busy. Was he covering his friend’s six now or leading them down a path of fruitless hope? Nothing was certain when it came to his father. Well, nothing except the fact that the one thing George Zane Alexander the second could never get over was his son joining the Navy against his wishes. And Zane didn’t stop there. He’d taken it one step further by trying out for the SEALs. Then, as soon as he’d proven himself, he went for DEVGRU’s Green Team training and selection—the infamous Seal Team Six the media liked to shout about. Even if those actually in the elite unit didn’t like or want the fame the media had thrust upon them after the Bin Laden raid, Zane was indeed among the best of the best, in spite of his old man’s wishes. The problem was that once he’d reached the top, there was nowhere left to go to piss off his father. Zane saw Jon’s vision for GAPS as the right opportunity at the right time. To be able to take their skills and use them as they saw fit and be their own bosses—it was tempting. A dream come true. Of course, that was only if Zane got through this meeting with good old George without taking a swing at the man, which is what had happened the last Christmas he’d tried going home to play at being a happy family. You don’t talk bad about the troops or make disparaging remarks about the war to a man who’d watched friends get blown up. Zane clenched his jaw and pocketed the anger. 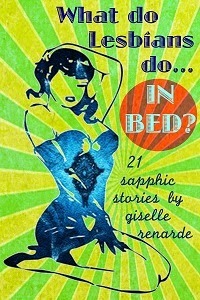 Get it in eBook and Paperback Now! I rushed to the back staircase and popped two buttons on my blouse. Nobody else worked in the basement. Just Levy. No one else would see. In my wedge heels, I had to be careful walking down those slatted metal stairs. It really was scary in the basement. Everything was either concrete or metal, and the only sign of life came from Levy’s blaring headphones. She obviously hadn’t noticed me yet, and I gripped the metal railing, just watching her work. There was something about dykes who looked like truck drivers that really turned me on. That was Levy’s style—dark blue pants like mechanics wore, and an unbuttoned short-sleeve shirt over a tank top. Her sandy hair was about shoulder-length, but she always wore it back in a ponytail, with a baseball cap that had a bulldog on it. Just the sight of her made me tremble. I was so wet she could probably fist me in one go if she wanted to. And that was the kicker: so far, she hadn’t expressed any interest in me. None. At all. Every shift, I dressed a little more femme—brighter lipstick, shorter skirt, higher heels. Anything to grab her attention. When I finally worked up the courage to call her from the bottom of the stairs, she didn’t hear me. I crept toward her cage until I was close enough to weave my fingers through and shake it.